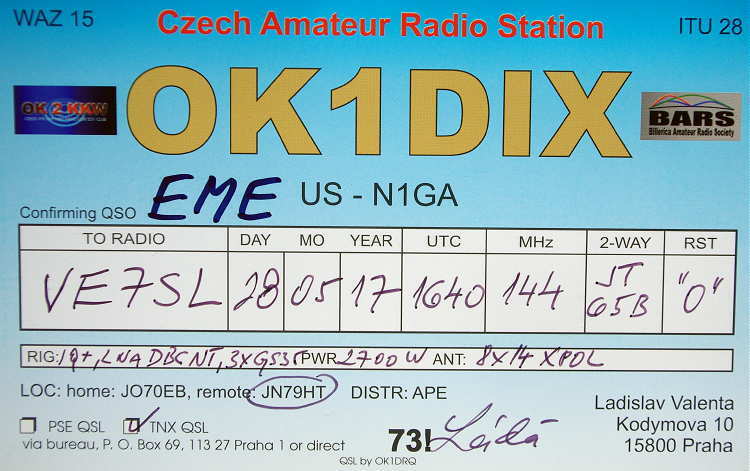 With QSLs still arriving from previous 2m EME action, I was looking extra forward to late July's very short window. When last month's activity was interrupted by my 140W brick amplifier catching fire, I was anxious to see if my repairs and homebrew RFC would still allow me to play on the moon. With July's best-positioned moonrises being too close to the sun (which was also rising at the same time), I was only able to spend a short time over two days before the moon travelled too far to the south and into my neighbour's trees. 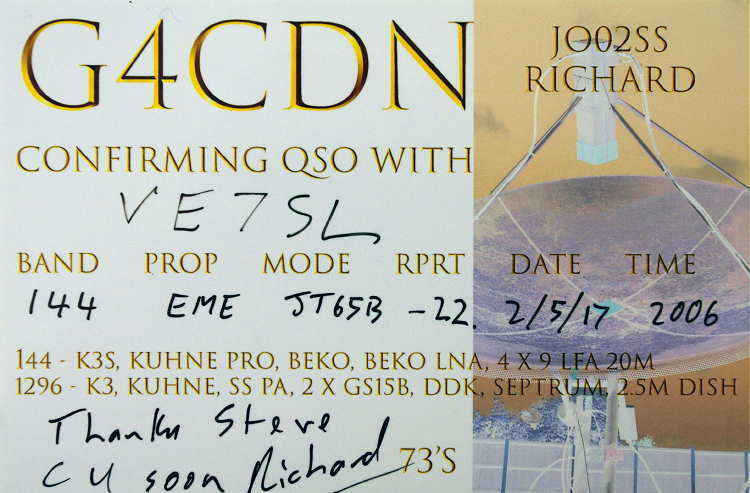 Luckily I was rewarded with what seemed like very good lunar conditions, enabling me to easily work six different stations ... three of them being all-time new ones and boosting my EME initials total to 112. In addition, DL1VPL told me that he was able to copy me with his single 12el Yagi during the QSO with I2FAK! 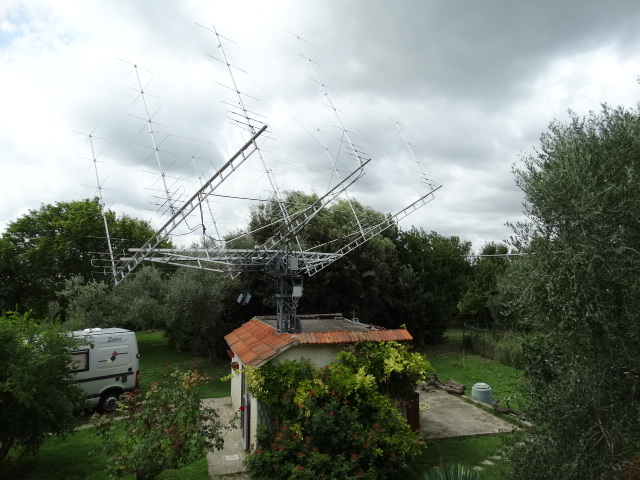 Needless to say, a contact between two single Yagi stations would be truly remarkable. 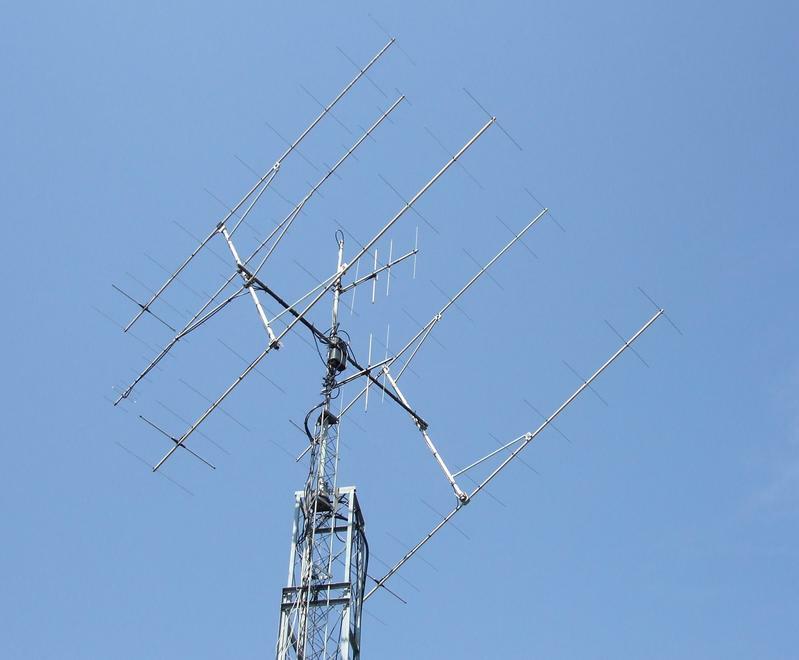 I've only been able to copy a single Yagi station once over the years. I was gratified to see that letting the smoke out of my little amplifier last month apparently caused no permanent damage and the repair seems to be holding up ... but I'll leave the bottom off for now just in case it gets any more crazy ideas. This coming weekend will see another CLE challenge. This time the hunting grounds will be: 370.0 - 384.9 kHz. For those unfamiliar with this monthly activity, a 'CLE' is a 'Co-ordinated Listening Event', as NDB DXers around the world focus their listening time on one small slice of the NDB spectrum. 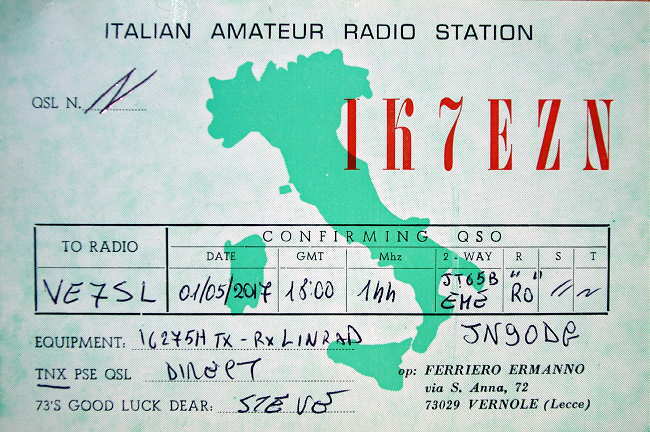 A nice challenge in this one is to hear the Berens River (Manitoba) NDB, 'YBV', on 370 kHz. 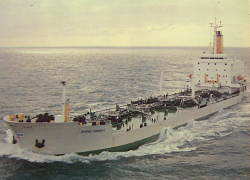 'YBV' is a 25-watter and is well heard, having been logged from coast-to-coast as well as in Europe. Look for 'YBV's CW identifier, repeated every 10.4 seconds, on 370.373 kHz with your receiver in the CW mode. Summertime CLEs can often be challenging, not because of poor propagation but more likely, summer lightning storms ... hopefully it will be quiet for your location. When tuning for NDBs, put your receiver in the CW mode and listen for the NDB's CW identifier, repeated every few seconds. 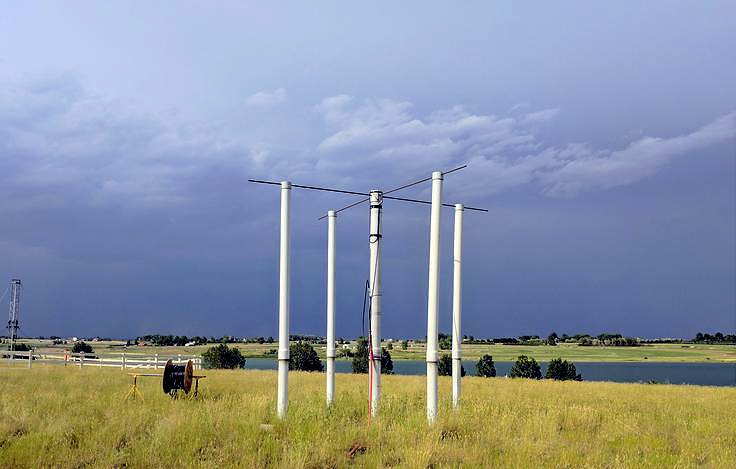 Listen for U.S. NDB identifiers approximately 1 kHz higher or lower than the published transmitted frequency since these beacons are modulated with a 1020 Hz tone approximately. For example, 'AA' in Fargo transmits on 365 kHz and its upper sideband CW identifier is tuned at 366.025 kHz while its lower sideband CW ident can be tuned at 363.946 kHz. Its USB tone is actually 1025 Hz while its LSB tone is 1054 Hz. Often, one sideband will be much stronger than the other so if you don't hear the first one, try listening on the other sideband. Canadian NDBs normally have an USB tone only, usually very close to 400 Hz. They also have a long dash (keydown) following the CW identifier. All NDBs heard in North America will be listed in the RNA database (updated daily) while those heard in Europe may be found in the REU database. Beacons heard outside of these regions will be found in the RWW database. this Friday. All are very welcome. CLEs are not contests - if you enjoy taking part you will be a winner! listened on these same frequencies. It will certainly be tougher for most of us at this time of year. plus any UNIDs that you come across there. (not in an attachment) with 'CLE221' at the start of its title. # The date (e.g. 2017-07-29, etc., or just 29) and UTC. and Distance go LATER in the same line. If you send interim logs, please also send a 'Final' (complete) log. that you were using during the weekend. Tuesday - you can check from it that your log has been found OK.
August at the very latest. hopes to complete on that day. 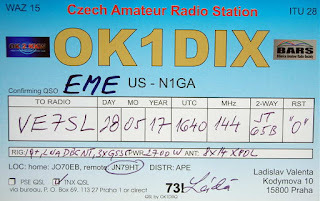 The very active Yahoo ndblist Group is a great place to learn more about the 'Art of NDB DXing' or to meet other listeners in your region. There is a lot of good information available there and new members are always very welcome. As well, you can follow the results of other CLE participants from night to night as propagation is always an active topic of discussion. You need not be an ndblist member to participate in the CLEs and all reports, no matter how small, are of much value to the organizers. 'First-time' logs are always VERY welcome! 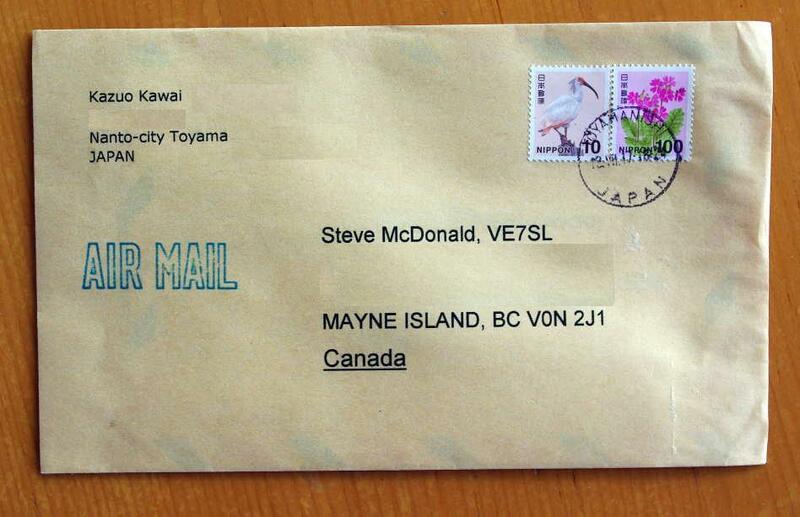 Reports may be sent to the ndblist or e-mailed to either myself or CLE co-ordinator, Brian Keyte (G3SIA), whose address appears above. Please ... give the CLE a try ... then let us know what NDB's can be heard from your location! Your report can then be added to the worldwide database to help keep it up-to-date. 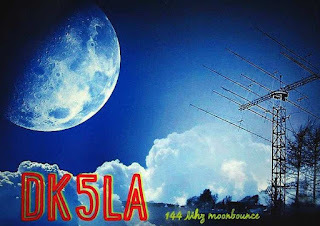 Several weeks ago I mused about my interest in earth-mode VLF experiments, following the inspirational exploits of G3XBM in his earth-mode work a few years ago. His low powered system utilizing a 5W audio IC and simple circuitry produced surprisingly interesting results over several kilometers. 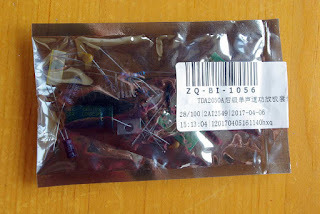 With possible future experimenting in mind, I found a nice low-powered IC audio amplifier kit from China on e-Bay, capable of producing about 18W at 12V ... more with higher voltage and proper heat-sinking. 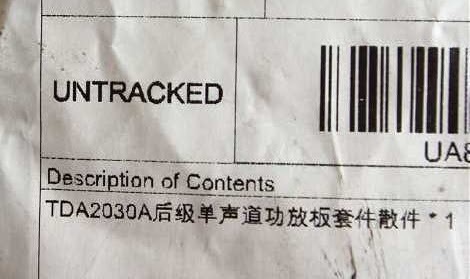 Whenever buying from China, I look for a dealer with the highest feedback rating and always compare their complaints versus the number of orders shipped. There always seems to be a few that are 99.9 - 100%, which, for me, has always assured that they are probably not selling junk. Anything lower than 98% can often be a red flag. The kit was just $1.50 and with free-shipping, what's to lose? A few weeks after I had placed my order, the nightly TV news had a spot regarding the problem that these "free shipping" packets were creating for Canada Post and their customers. 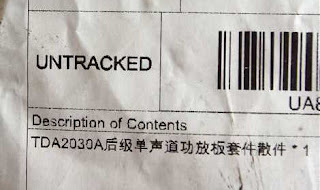 It seems that in the past few months, as more and more "free" shipments were arriving from the far east, Canada Post had not been able to keep up with the processing. The news spot showed row upon row of shipping containers parked at the back of Vancouver International's (YVR) postal processing plant, with all of them filled with thousands of small "free" packets waiting to be processed! 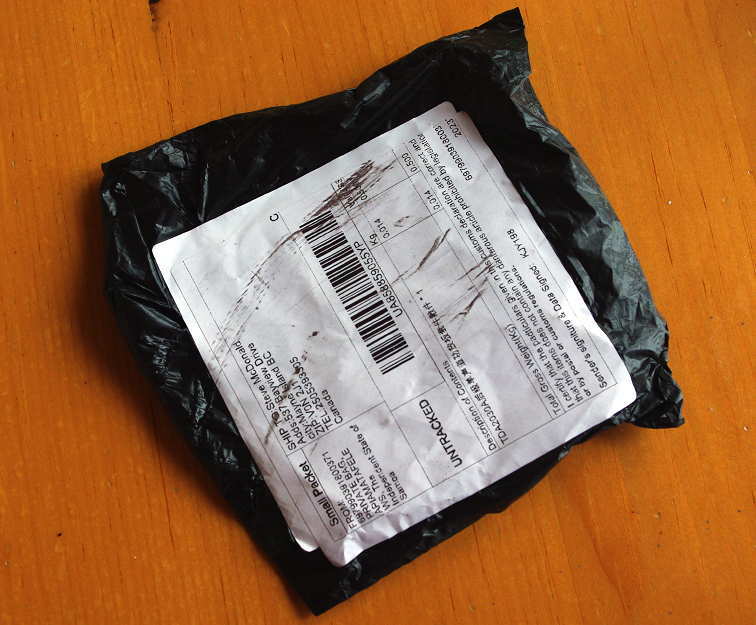 It seems that each packet needs to be scanned by the border security folks (CBSA) for illegal material before it can be processed by Canada Post and the back-up was building at a tremendous rate. There appears to be little if any profit for Canada Post with these smaller untracked packages and they are given the lowest priority-rating possible. In order to speed up the process, both CBSA and Canada Post facilities would need to expand their operational capabilities at the airport and I suspect there is no serious will to do this until pressured politically by angry customers. All parcels from China that are mailed to Canada stop at Vancouver's YVR before going further. The mammoth recent increase in online "free-shipping", in spite of the normally estimated 3-4 week delivery time, has proven too attractive for customers and our domestic system has failed to meet the new load demands. With this new information in mind, my e-Bay purchase would prove to be an interesting test of the system and of the TV news spot's accuracy. Normally, I would have expected my tiny parcel to arrive in about 30 days, but mine would be one that eventually ended up in the airport parking lot. The kit finally arrived this week, with a delivery time of 89 days! Many online sellers will offer an inexpensive option to pay for faster shipping, something that will still take a couple of weeks but much better than three months. If you are given this inexpensive shipping option I would highly recommend that you choose it, and if not, ask for an alternative to "free shipping". Unless something changes soon, delays will continue to increase. I also wonder, and perhaps you can comment below, are U.S. customers seeing the same long delays as we here in Canada are experiencing when the "free shipping" option is chosen? 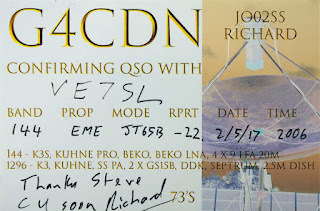 QSLs in my mailbox always excite me ... especially like yesterday's, arriving in a thin light-brown envelope decorated with colorful stamps. I'm 100% certain this is because of receiving similar-appearing envelopes containing QSL cards during my formative years from age eleven onward and how much enjoyment the cards from shortwave stations all over the world brought me at this young age. 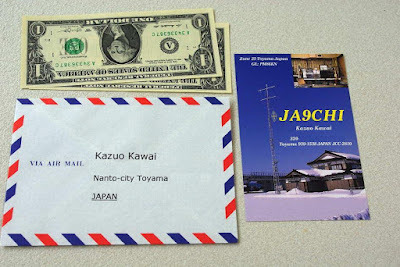 For me, there is no replacement for a paper QSL, but sadly, this long-standing tradition is slowly slipping away due to the high cost of mailing even a normal-size envelope. 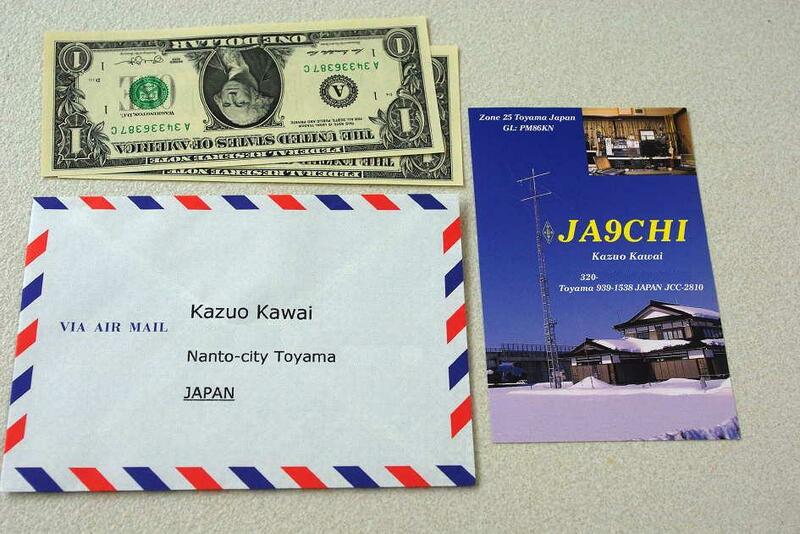 Earlier this summer I had a nice run of JA's on 6m Es but this time, instead of CW, they were on JT65A. Yesterday's card was for one of the digital contacts. Signals were weak, at -23 db ... far too weak to be heard on CW but easily readable during the 60 second deep-listen period mandated by the JT65A mode. 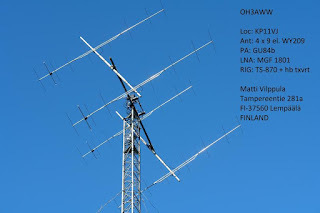 With so many stations now listening higher in the band for JT-mode signals, there has been very little activity on CW and now, with the introduction of yet another new digital mode, FT8, even the digital activity is split into sections, with neither mode being compatible. 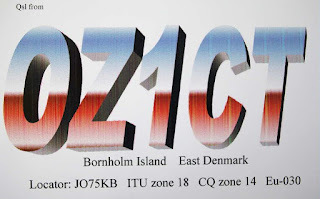 I have held off installing the newer WSJT-X version containing the FT8 fifteen-second transmission mode until all of the bugs are ironed out ... the software will likely be tweaked a few more times yet before it reaches the polished final version we see for JT65 and others. FT8 has been designed for weaker 6m Es openings that are often too short in duration for the longer time periods needed by JT65's sixty-second sequences. FT8 contacts can be completed quickly, before short-lived signals can drop out, but the shorter sequences come at the cost of reduced sensitivity ... probably a worthwhile tradeoff. Conventional mode activity on 6m has suffered tremendously with the introduction of these new modes and it seems that if you want to work weak signal DX (and not all do), sadly it may be digital or nothing at all if the trends continue. If all of the DX moves from CW to digital, for me, much of the magic will disappear as well. Letting the computer do all of the thinking is not nearly as satisfying or enjoyable as using my brain and CW skills to put a new rare one in the log. 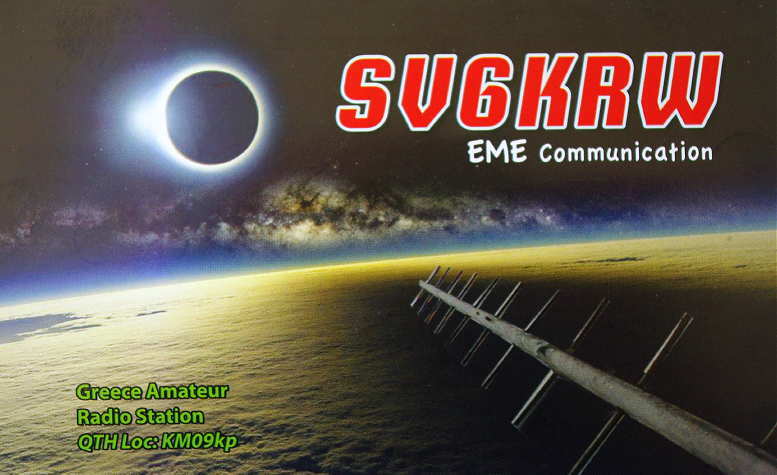 Six meters continues to evolve and I'm not overly excited by the direction it seems to be going. WWV's New Antenna On 25MHz - QSA? 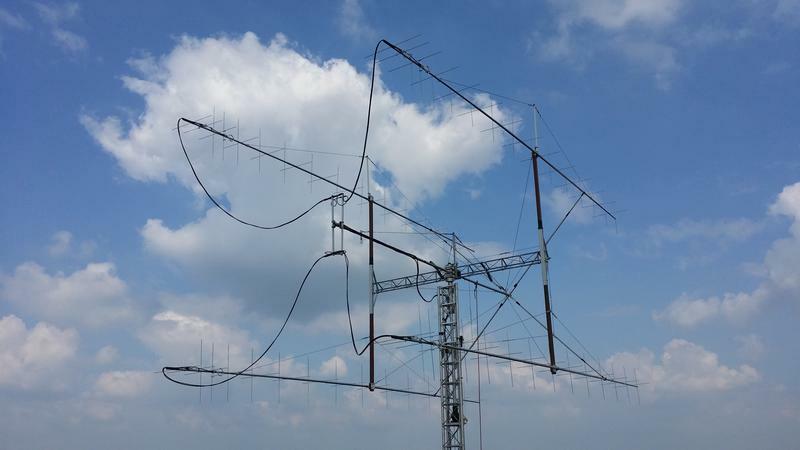 Last week's ARRL announcement regarding WWV's new circular polarized Turnstile antenna tests on their 25MHz transmitter quickly garnered my interest. Their 25MHz signal used to be heard world-wide on F2 until it was dropped in 1977, but somewhat surprisingly, was resurrected in 2014. 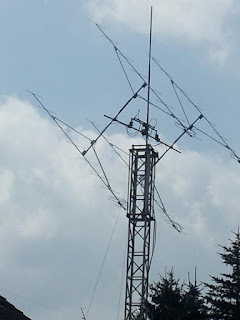 I recall hearing its 2nd harmonic on sporadic-E very routinely on 50.000MHz when I first became active on 6m back in the late 60's. Back then it was also not uncommon to hear the 3rd and 4th harmonics of ship CW stations operating on 12 and 16MHz, at the very low end of 6m and just below the band edge on 49MHz. 6m Prop Indicator From The 70's! They were often heard calling or working maritime land stations in Hawaii or Japan and the reception of these signals meant that the band was open out to the Pacific somewhere ... but of course there was no way of knowing just how far out they were and there were never any amateur signals to be heard. Having not listened for WWV's 25MHz signal for several decades, I set up yesterday to see if it could be heard here in mid-summer. Using my Perseus SDR and my LF/MF inverted-L, self-resonant in the middle of the broadcast-band (gosh knows what the pattern looks like up on 25MHz! ), I started monitoring just after lunch. 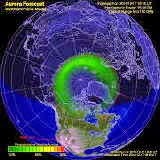 I could detect their carrier which was very weak but steady, probably arriving on ionospheric scatter via the e-layer. A few hours later I re-checked after hearing a few Colorado signals on 6m Es and sure enough, there they were with a fairly robust signal. It too, was no doubt arriving via sporadic-E as it was again today during another widespread Es opening from the PNW to as far south as Puerto Rico. Here is a recording of the 25MHz signal made this morning with my Perseus SDR along with a comparison recording of their 20MHz signal, made about 30 seconds later. 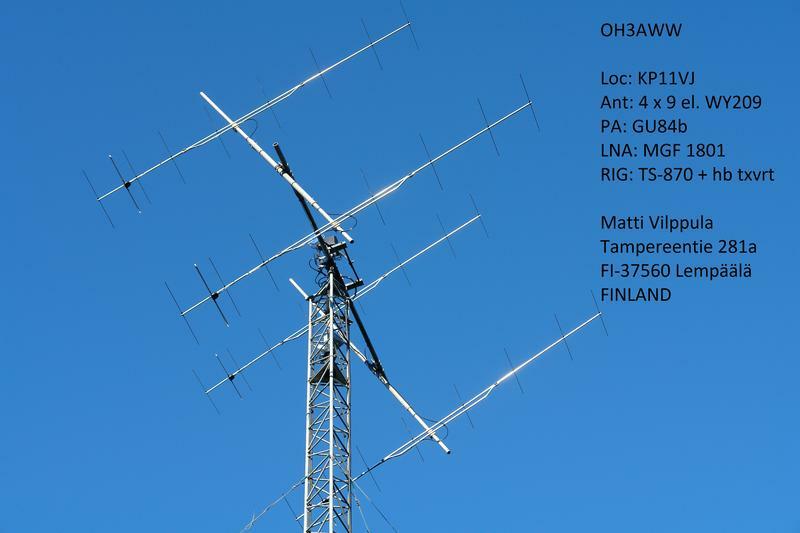 There is not a lot of difference between the two and both run similar powers ... 2.5kW on 20MHz and 2kW on 25MHz. The 20MHz system uses a half-wave vertical on a 7.5m tower while the 25MHz outlet uses the crossed-dipole circular polarized Turnstile shown at the top of the blog. 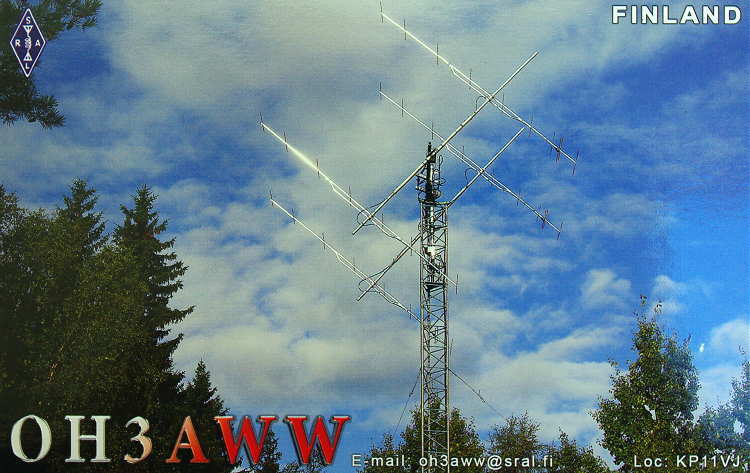 Reception reports of their 25MHz signal are being sought and can be e-mailed to WWV at this address. RFI - More Vigilance Coming? A posting yesterday in the Yahoo MW DXer's Group pointed to a new article at RadioWorld.com, re the new urgency within the broadcast field to address the growing noise floor. The article "Noise Inquiry Spurs Recommendations" discusses the fallout from last year's FCC Technical Advisory Council's (TAC) Inquiry ET-16-191, seeking public comments on the rapid increase in "man-made RF noise issues". As radio amateurs have known for decades already, there is a huge problem when it comes to spectrum noise levels. They were even complaining about this way back in 1932's Short Wave Craft ... "The reasons for this extraordinary amount of noise which we have to contend with at the present time are manifold." If only they knew how quiet it really was! Now that noise is beginning to have severe affects on profit margins when it comes to AM, FM, TV and Wi-Fi connected devices, it seems that there may now be a larger appetite for some resolution. "Other industries using RF wireless technologies report growing noise trouble as well. A recent IEEE Spectrum article was subtitled “Electronic Noise Is Drowning Out the Internet of Things.” Designers of IoT devices are not getting the range they expect due to unexpectedly high background noise, it reported." Comments to the enquiry pointed out the usual offenders, all well-known to hams, such as noisy powerlines, switching power supplies, noisy motors etc and emphasized the fact that none of these offenders should cause interference if properly designed. The TAC Working Group recommended some steps that it thought the FCC should take with the key one being an FCC Notice of Proposed Rulemaking to "resolve unanswered questions and take corrective action". there had been no official RF noise studies done in over 40 years. some manufacturers are deliberately cheating to skirt emission requirements. those in charge of enforcement (FCC) need to be more diligent. Much can be said for the same conditions here in Canada where our ISED has failed to properly safeguard spectrum noise pollution. Other somewhat "telling" recommendations were also put forward and can be viewed in the Radioworld article here. It is reported that the new FCC Chairman seemed receptive to the concerns presented but so far there has been no official action. Hopefully he will soon tackle this with the same gusto shown for chasing down illegal broadcasters. With recent FCC cutbacks and proposed budget slashing from Washington, one wonders if this problem will be given the attention that it needs before it is truly too late to reverse. Last week's favorable northern declination of the Moon allowed me two days of activity, once my moonrises had lagged far enough behind the early sunrises. With fixed elevation and not having the ability to track the moon as it rises, I can only operate for about two hours before the moon gets too high. The highest elevation that I am able to work seems to stop near 20 degrees. With QSLs from earlier sessions still arriving, I noted last week's activity was down somewhat from the previous month ... summertime activities usually take priority over EME for most moonbouncers. Interestingly, all of the stations answered one of my CQs, with one CQ having three different callers at one time ... pretty exciting and something that I don't think has occurred here before! But that wasn't the only excitement of the week. 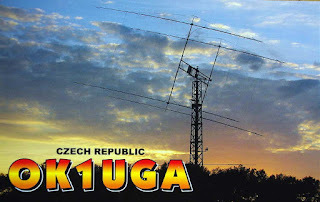 In the middle of a CQ following my QSO with IK6CAK, I heard a faint 'crack' sound from my amplifier, an aging RF Concepts 2-135, followed by the unmistakable whiff of a 'too hot' electronic component ... every ham is familiar with this always unwelcome odor and it usually spells trouble. During the next CQ, I saw a trace of smoke coming out of the amp's back corner vent holes, at which point I reluctantly shut things down in the middle of some superb EME conditions. 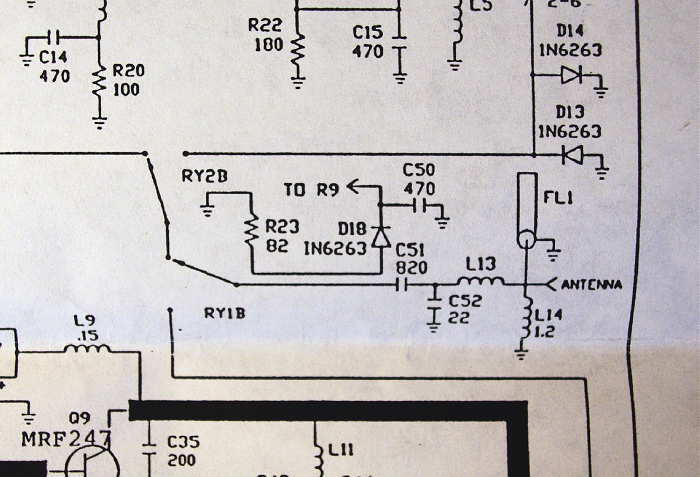 After tearing into the amplifier, the only thing that looked stressed was a small inductor (L14 below), part of the output filtering / impedance matching circuitry. It looked a little darker and somewhat stressed and as I gave it a poke with a screwdriver blade, it immediately disintegrated into what you see below. 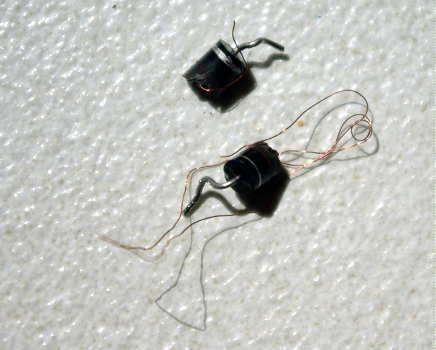 It was a small (1.2uH) encapsulated RFC which appeared to be wire-wound on a core material that I did not recognize and likely suitable for VHF. I surmised that after several years of 100% duty-cycle JT65 operation, the inductor had been over-stressed to the point of failure ... helping to filter all of those nasty high frequency harmonics can't be an easy job! 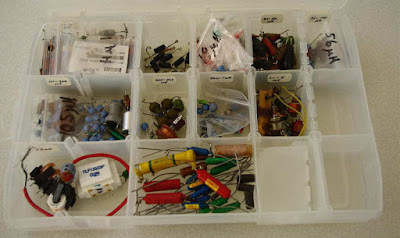 After a search of my RFC collection (see below), salvaged mostly from junked TVs, monitors, VCRs and other electronic cast-offs temporarily 'borrowed' for stripping from our local recycle center here on Mayne Island, I settled on a 1.2uH choke that I hoped would be a suitable replacement. It had just a few turns so I assumed it was wound on some sort of powdered iron or ferrite form. Whether or not it would behave at 144MHz was another question. After reassembling the amplifier the following morning, I keyed up at full power during the EME window but halfway through my initial CQ I saw smoke and then flames coming from the inside of the case ... yikes! Shutting down immediately killed the fire and after tearing into the amp yet again, I saw that this time, the output coupling capacitor (C51) had completely destroyed itself. The new inductor (L14) appeared a little heated, but I assumed it was only smoke-damaged from the nearby flameout of the capacitor. I replaced C51, an 820pF silver mica, with a higher rated one of the same value and, once again, gave it the smoke test ... literally. After a few seconds, a whiff of smoke appeared from the back of the amp, followed by the SWR trip-out kicking in and shutting the amp down. 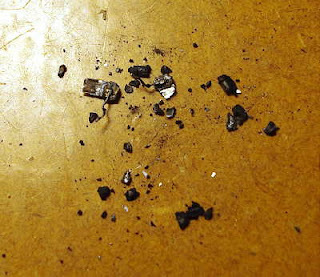 This time it appeared that the inductor was definitely complicit in the destruction of the capacitor as it was charred and black. I surmised that whatever core material the little inductor was wound upon, definitely was not suitable at 144MHz and had caused the little inductor to either change value or to saturate ... whatever it was doing had created a highly reactive condition in the output circuit, changing the output load impedance and sending the SWR sky-high. This time I replaced the inductor with a homebrew one, wound on a plain phenolic former, hoping to avoid any ferro-magnetic / frequency compatibility issues. After reassembling the amplifier, it seemed to be happy once again and ran nicely for several 60 second JT65B sequences at full power with no smoke or component heating! By this time I had run out of favorable EME windows as my moonrises were now too far to the south to keep me away from the neighbour's trees ... I'll just have to be patient and wait until the end of the month for the next definitive test. Let's hope there's no more smoke. 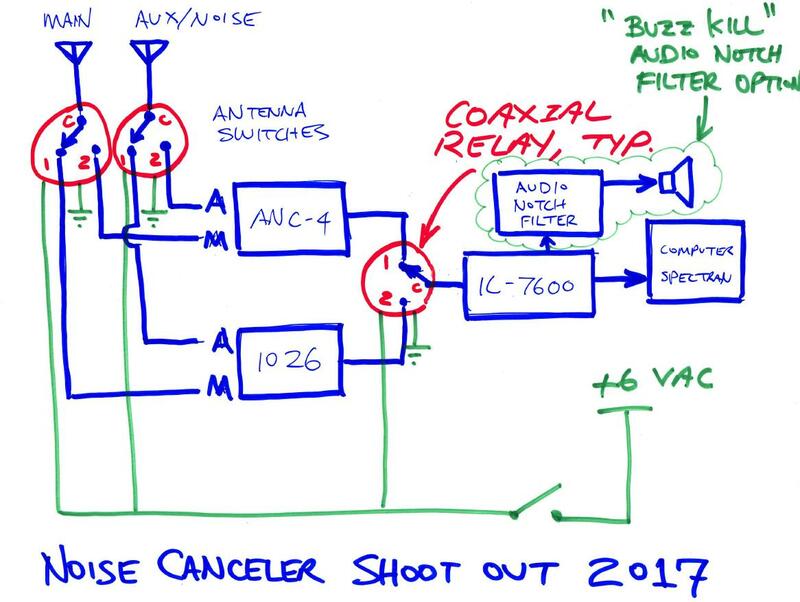 A previous blog described a series of tests that Mark, VA7MM, performed demonstrating the effectiveness of his newly acquired MFJ- 1026 Noise Canceller. He, along with Guy, VA7GI, recently had the opportunity to compare the performance of the MFJ against Guy's Timewave ANC-4. 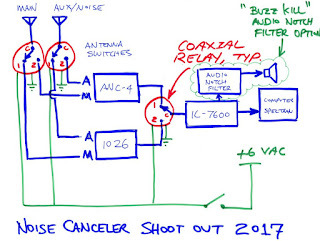 Guy Immega, VA7GI, and Mark Mattila, VA7MM, undertook side by side comparative tests of Timewave ANC-4 and MFJ-1026 noise cancellation gear (photos attached) by listening to interference at VA7MM in the HF spectrum between 7 MHz and 14 MHz. The program Spectran was used with the receiver on AM to adjust each unit for best performance and observe the relative performance of each. 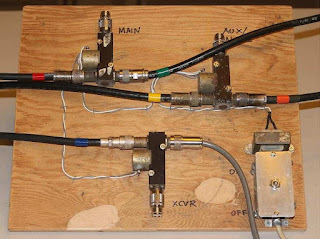 A system of coaxial relays was used to switch instantaneously between the units (photos attached). For practical purposes Timewave’s ANC-4 and MFJ’s 1026 are equal performers for eliminating interference in the HF spectrum. Our findings corroborate the earlier findings of VE7CA that are posted on his website. 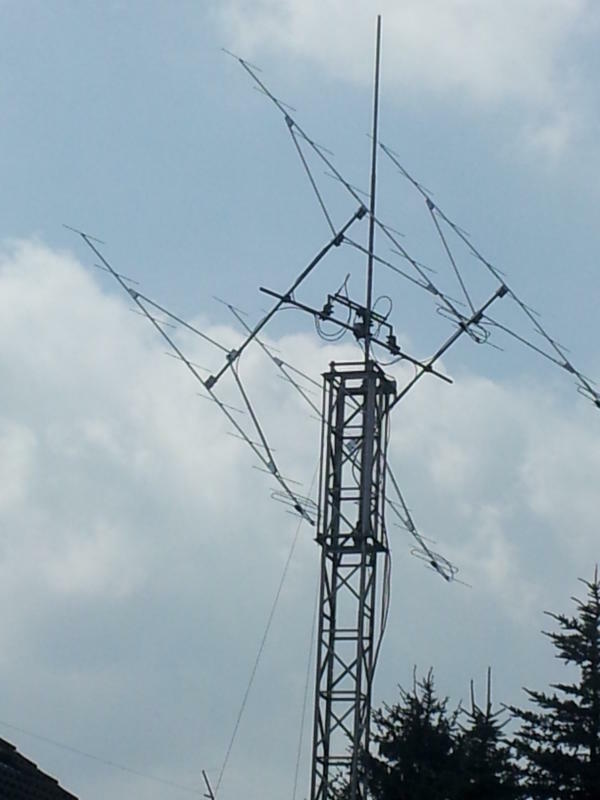 Switching the units in and out of noise was previously assessed on 40m CW, broadcast and raw noise. Examples of these tests are in a previous blogspot. 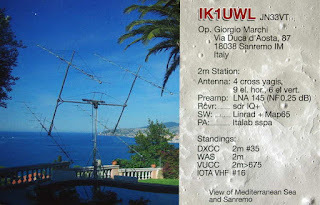 - main antenna in the tests was a multiband dipole at 30m above the ground. 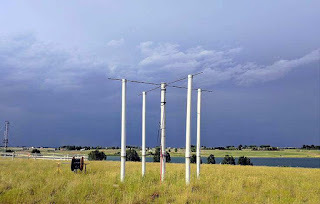 - noise sense antenna was a Cushcraft R7 vertical antenna located 20m away from the main antenna. 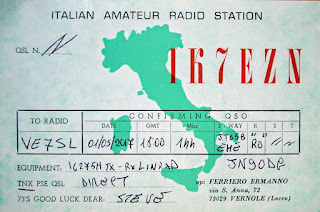 - receiver was an Icom IC-746Pro. - both units tested have the same nulling capability. - the preamp on the MFJ was found to be useful in certain instances for boosting the noise signal. - in one test instance the Timewave unit produced intermod with AM broadcast leaking into the receiver when the noise gain was set near maximum. - in instances where noise was coming from more than one direction, the filters could eliminate one noise source, or the other, but not both. - the Timewave and MFJ filters have a learning curve to figure out how to quickly and precisely null out noise. A couple of evenings of tinkering was required to figure out how to use the unit with different noise sense antennas and different types of noise. 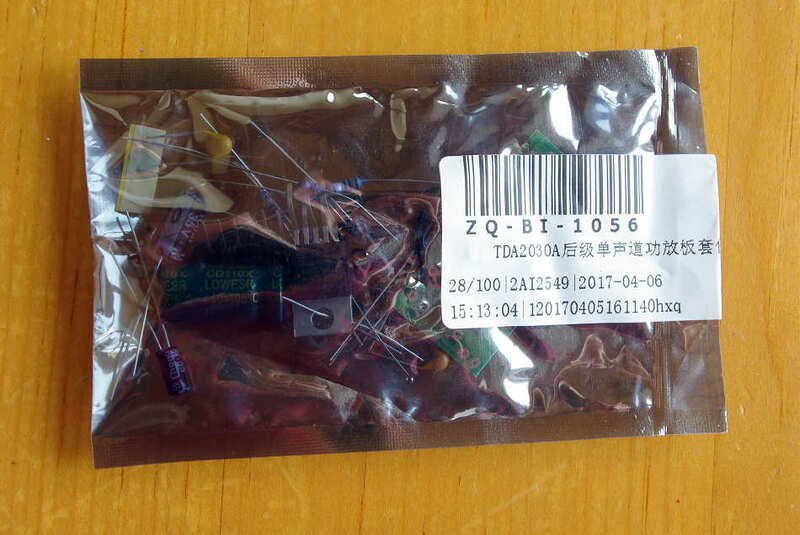 - the noise sense antenna is critical and must pick up a strong noise signal for the units to work effectively. 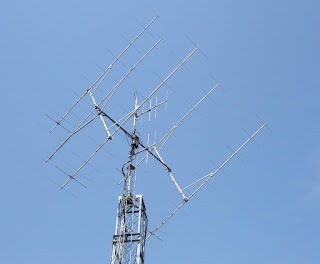 In most instances for local interference at VA7MM the noise sense antenna is near the ground and vertically polarized and the main antenna is high above the ground and horizontally polarized. - both noise amplitude and phase need to be alternately adjusted to attain a good null on the units. - using Spectran or SDR with the receiver on AM helps in adjusting the units. 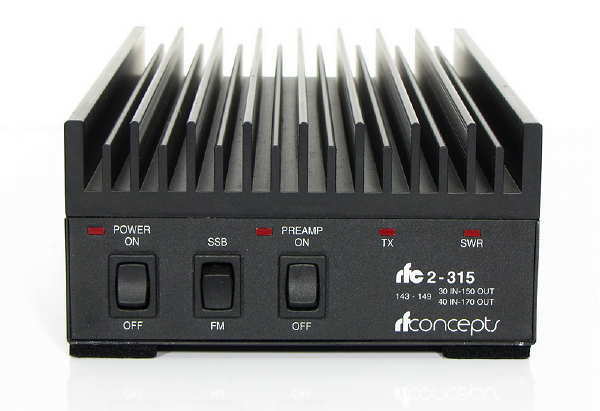 - discussions are on combining the noise canceller with a small vertical plane receive loop on 160 or 80m. The idea is that the combination of the two could enable noise in two directions to be nulled. The receive loop would be pre-amplified. 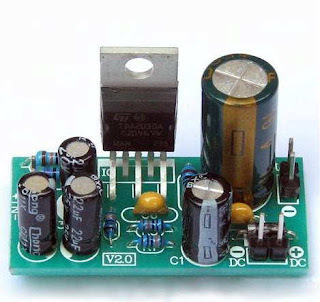 - having two noise cancellers in series was also discussed as a means of nulling noise from two directions. An issue with this approach is that more processing electronics are put ahead of the front end of the receiver and this introduces its own noise and may create intermodulation. - I like that the MFJ unit has gain controls for both the noise antenna and the main antenna. Other differences include MFJ providing both relay and RF sense T/R switching whereas the Timewave only has RF sense capability. 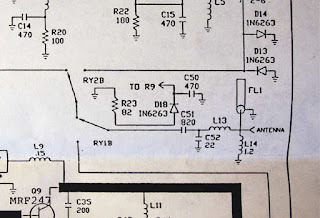 The noise antenna connector on the MFJ is an SO-239which I find more practical than the RCA phono socket on the Timewave. As far as mechanical construction is concerned, the Timewave is more robustly built. We’re open to any questions on these findings.